Young lovers Manuel and Lia manage to break into Tania’s house, from which she’s been evicted. As the three unexpected roommates compete for the space, tensions rise. Will Tania be able to kick them out and get her home back? The situation slowly brings the trio closer, creating a common silent language like that of giraffes. Eventually, together, like a tribe marginalized and enclosed by society, they will have to face a bigger threat. After bowing at the International Film Festival of Rotterdam last year, JIRAFAS has gone on to win over audiences all over the globe, winning a Spirit Award at the Brooklyn Film Festival and having been chosen as one of two films to represent Cuba in the 35th Havana Film Festival. Enrique Álvarez was born in Havana in 1961, and has a degree in Art History and Cinematography. 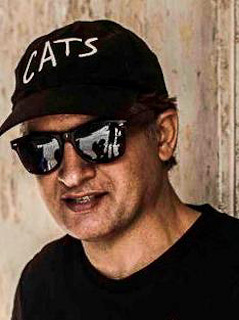 Since 1987, he has gone on to make many short and feature-length films. For MIRADAS, his feature debut, he received the Prize for Best Unpublished Script at the 18th International NCL Festival. He has since directed VENICE, the first Cuban film produced through crowdfunding. He is currently the coordinator of the fiction film program at EICTV.